Pianist/composer, Marcus Roberts, has been hailed “the genius of the modern piano”. In 2014, the celebrated CBS News television show, 60 Minutes, profiled his life and work on a segment entitled “The Virtuoso”. 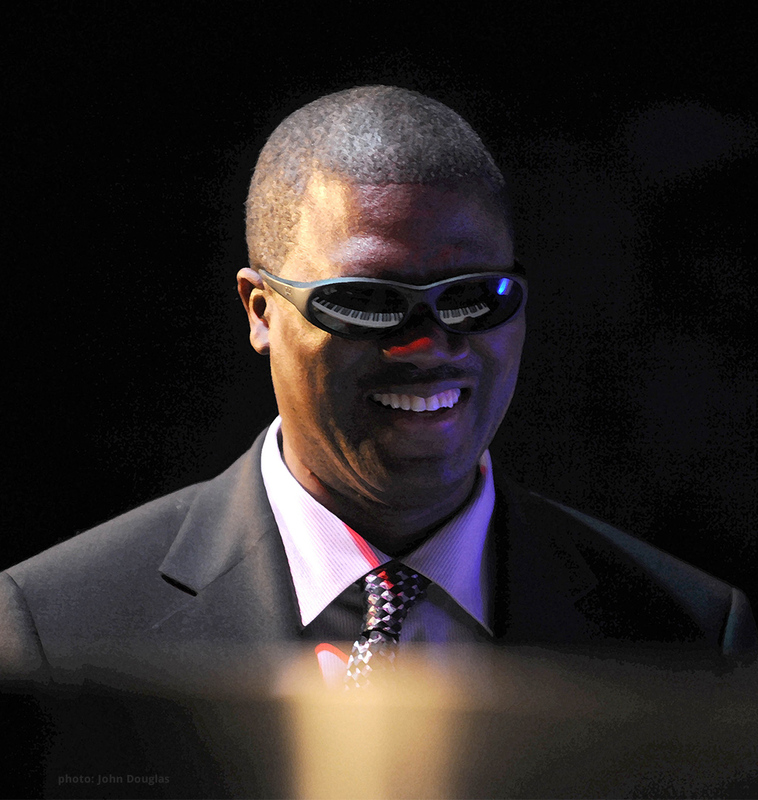 The show traced Roberts’ life to date from his early roots in Jacksonville and at the Florida School for the Deaf and Blind to his remarkable career as a modern jazz musician. Roberts grew up in Jacksonville, FL where his mother’s gospel singing and the music of the local church left a lasting impact on his own musical style. He began teaching himself to play piano at age five after losing his sight but didn’t have his first formal lesson until age 12. Despite that late start, he progressed quickly through hard work and good teachers. At age 18, he went on to study classical piano at Florida State University with the great Leonidas Lipovetsky, whose own teacher was the celebrated Madame Rosina Lhévinne. Roberts has won numerous awards and competitions over the years, but the one that is most personally meaningful to him is the Helen Keller Award for Personal Achievement. While Roberts is known for his remarkable ability to blend the jazz and classical idioms to create something wholly new, he may be even better known for his development of an entirely new approach to jazz trio performance. Roberts’ critically-acclaimed legacy of recorded music reflects this tremendous artistic versatility. His recordings include solo piano, duets, and trio arrangements of jazz standards as well as original suites of music for trio, large ensembles, and symphony orchestra. His popular DVD recording with the Berlin Philharmonic showcases his ground-breaking arrangement of Gershwin’s Concerto in F for Piano and Orchestra (A Gershwin Night, EuroArts 2003). Roberts launched his own record label, J-Master Records, in 2009. Since then he has released several popular recordings on that label including New Orleans Meets Harlem, Volume 1 (trio), Deep in the Shed: A Blues Suite (nonet), Celebrating Christmas (trio), From Rags to Rhythm (trio), Together Again: Live in Concert (quartet), Together Again: In the Studio (quartet), and Romance, Swing, and the Blues (with the Modern Jazz Generation). In the fall of 2017, he released his newest recording called Trio Crescent: Celebrating Coltrane. Roberts tours with his long-standing trio featuring two phenomenal musicians—Rodney Jordan (bass) and Jason Marsalis (drums). Marsalis has held the drum chair in the trio for 22 years and when this trio performs, they sound like they have been performing together for decades. One of Roberts’ more recent musical projects is the founding of a new band called “The Modern Jazz Generation”. This multigenerational ensemble is the realization of Roberts’ long-standing dedication to training and mentoring younger jazz musicians. Both Marsalis and Jordan are also key founding members of this band. In addition to his renown as a performer, Roberts is also an accomplished composer who has received numerous commissioning awards, including ones from Chamber Music America, Jazz at Lincoln Center, and ASCAP, as well as the Atlanta Symphony Orchestra and the Savannah Music Festival who co-commissioned him to write his first piano concerto—Spirit of the Blues: Piano Concerto in C-Minor (2013). Following that premiere, he was commissioned by the great Seiji Ozawa and the Saito Kinen Orchestra to write a second piano concerto (Rhapsody in D for Piano and Orchestra), which was premiered in 2016 at the Ozawa Music Festival in Matsumoto, Japan, with many of the best classical musicians from orchestras around the world. Finally, Roberts has long been dedicated to the training and development of younger musicians. Each year, he returns to the Savannah Music Festival where he serves as an Associate Artistic Director as well as the Director of the annual Swing Central Jazz programs that bring high school students from all over the country to Savannah for educational programs and a band competition. Roberts is an associate professor of music at the School of Music at Florida State University. He holds an honorary Doctor of Music degree from The Juilliard School.